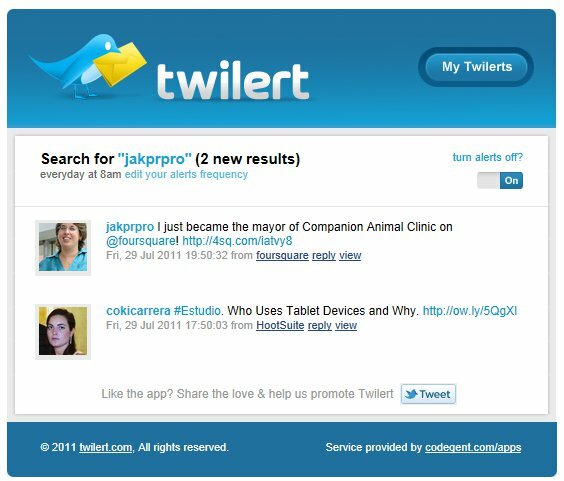 Twilert is a tool to keep up with the tweets on your brand. Sign up for alerts using your Google or Twitter account or create a twilert account. The system will e-mail you whenever there are tweets regarding your brand name and/or other search terms you set up. You designate the timing of alerts. Best of all, its free. I have been using this tool for a few weeks now and getting alerts each day in my inbox is effortless. Signing up was quick and easy. The only thing that threw me off was setting the interval for the alert. You type you preference with no parameters. The good news is the system seems to be able to accurately interpret just about anything you type.